The pumpkin has long been a favorite for Halloween. As an integral part of fall’s festivities, no home decor is complete without pumpkins. In all the fall’s holiday celebrations, pumpkins as jack-o-lanterns are your go-to decor that never fail. But is carving faces onto pumpkins the only way to use them? Do you really need to make them into jack-o-lanterns? The answer is no – there are endless possibilities to using the pumpkin for your Halloween or Thanksgiving decoration. All it takes is a few paint, some art supplies, and a little bit of imagination. Get creative and use ordinary art supplies to decorate your pumpkin. 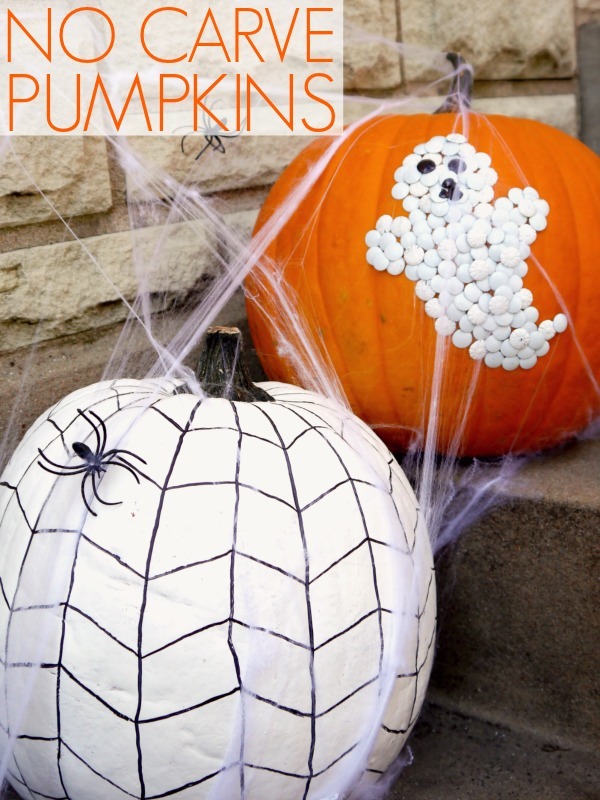 Take this super easy idea by using white thumb tacks to form a ghost on your pumpkin. 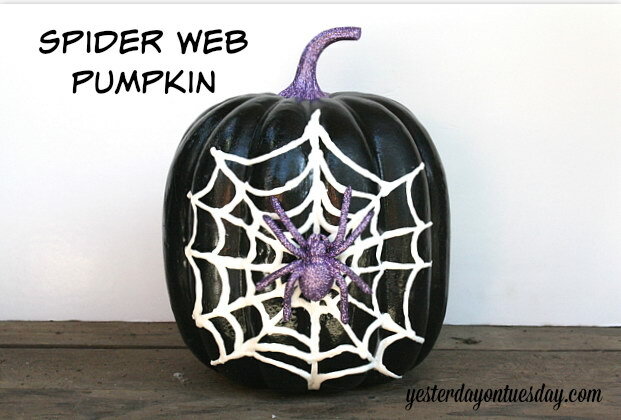 Or, you can simply paint a pumpkin white and draw spiderwebs. via creatingreallyawesomefunthings. 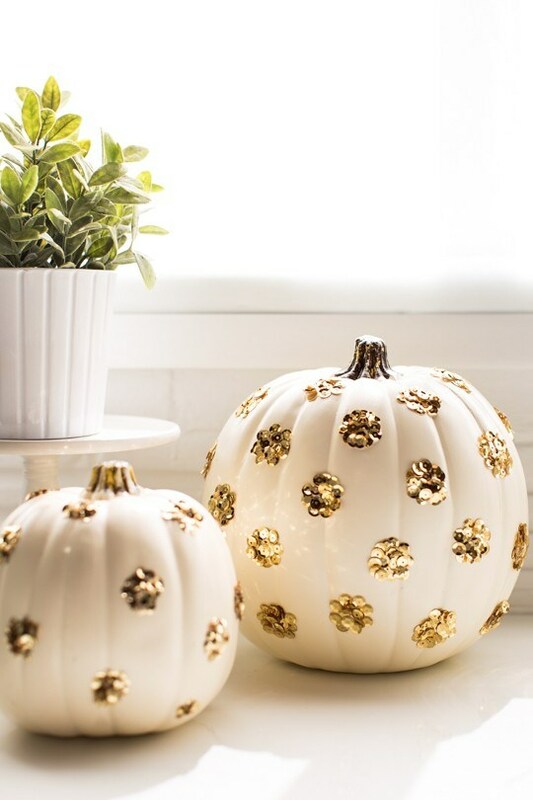 If you love all things shiny, why not use sequins on your pumpkins? Paint them white and decorate with sequins formed into flowers. via sugarandcloth. Fool your family and friends into thinking your pumpkins are precious blue porcelain. Paint them white, then paint precious blue flowers to make them look like priceless porcelain. Decorate on the dining table and blend them in with real blue porcelain objects for the full effect. via craftberrybush. Did you ever imagine you can turn your pumpkin into a Disney-themed ornament? Transform your Halloween pumpkin into Frozen’s Elsa by painting it blue, bedazzling it with white gems and snowflakes, and topping it off with a super cool tiara. via apumpkinandaprincess. Things that drip are always creepy and nasty. 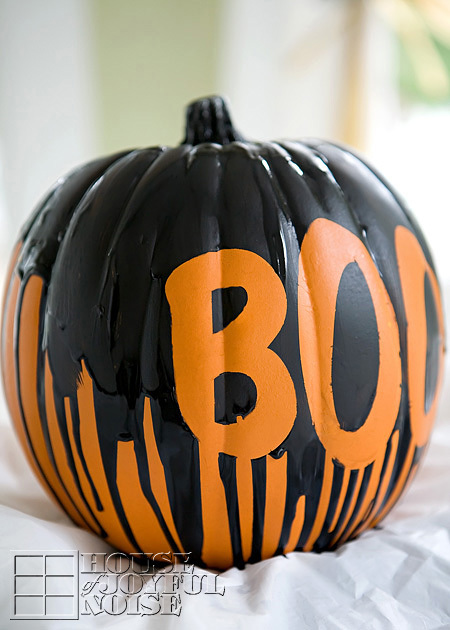 Melt some black candles or crayons and create a messy dripping effect from the top of your pumpkin. Spell out the word “BOO” for the complete Halloween appeal. via houseofjoyfulnoise. Pumpkins don’t always have to be creepy. Paint your tiny pumpkins in pastel colors and cover the stems with gold glitter – simply perfect for some super cute and kitschy Halloween decor. via nestofposies-blog. Even without carving your pumpkin, you can simply paint creepy faces to make them look like actual jack-o-lanterns. via blog.thecelebrationshoppe. Do you happen to love skulls? Buy a simple skull mask and glue on your pumpkin. Add some flowers on the skull’s head for a classic Day of the Dead Halloween decor. via fivebirdsonparade. If you don’t like the idea of using sequins, paint, or using other objects on your pumpkin, you can simply use cut outs of images. Simply cut out pictures of objects that you like – be it flowers, or even pictures of your family – and paste them on your pumpkin. Don’t forget to paint white glue over the images for a full decoupage project. via goldstandardworkshop. Don’t you just love fondant cakes? Especially multi-tiered ones that look so scrumptious? 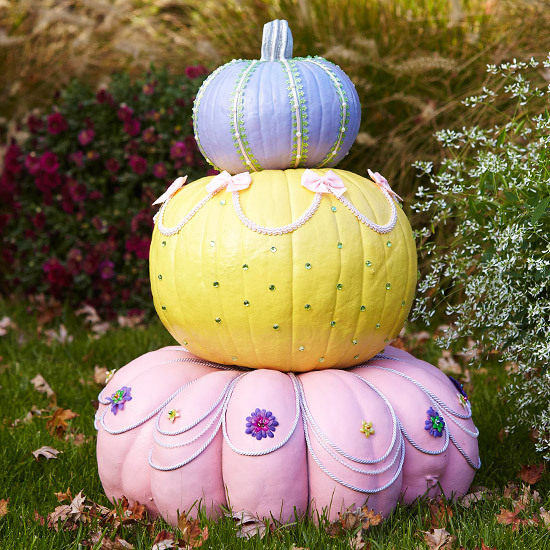 Well, you can actually make your pumpkins look like an actual tiered fondant cake by simply painting them in pastel colors, decorating them with gems, and putting them on top of the other. Make sure the pumpkins are of different sizes from large on the bottom to small on the top. via bhg. Your pumpkins can still light up in the dark! 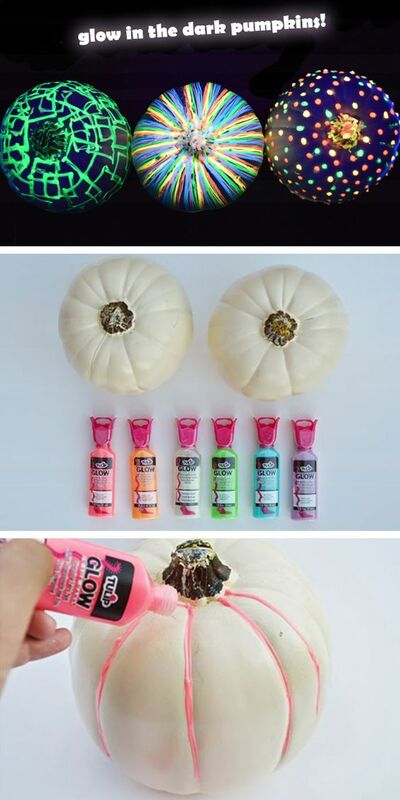 Use glow-in-the-dark puffy paint to decorate your pumpkin. Spell out the word “BOO” or paint any Halloween image for that matter – be it a bat, a cat, or a ghost! via club.chicacircle. Just like the skull pumpkin, you can create your very own Day of the Dead Halloween decor by simply painting your pumpkins white, and drawing a skull. Again, don’t forget to add some flowers for the complete sugar skull look. via bloglovin. Merge the look of fall and Halloween by using spray-painted leaves to decorate your pumpkin. Paint the entire fruit in black, spray paint a few leaves in silver, and glue the leaves on the bottom for an elegant and unexpected pumpkin decor. via ahomefordesign. Who would’ve thought you could turn a pumpkin into a giant cupcake? It’s not exactly creepy but it’s undeniably supercute and something kids would surely love to see. Paint your pumpkin white, decorate with pink ribbon, glue the top with cotton to mimic marshmallows, and add some pink covered buttons to mimic candies. Kids would never think the thing is a good old pumpkin. via hellowonderful. 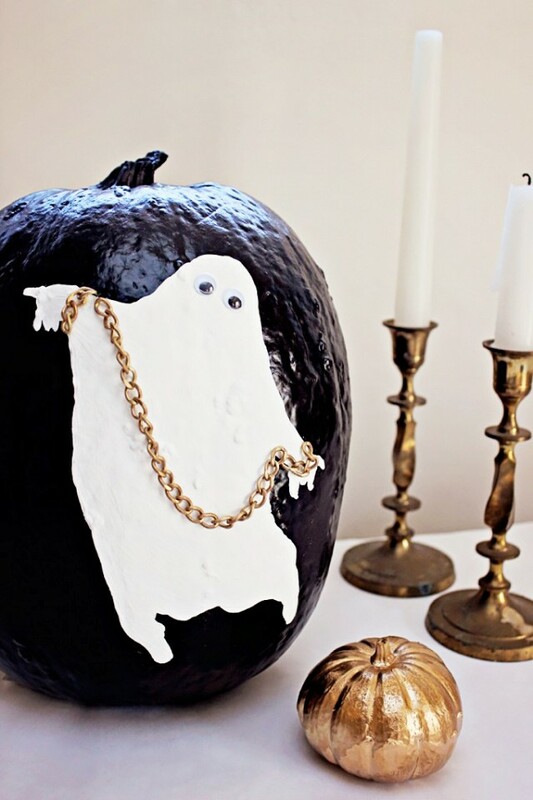 A super fast DIY project, paint you pumpkin in black and paint a white ghost over it. Simple yet on the spot for a super cool Halloween ornament. Aside from an image of a white ghost, you can also make several other images that symbolize Halloween. The moon is another integral symbol of the season, so get creative and use tiny white flowers to create an image of the moon on your painted pumpkin. via themerrythought. 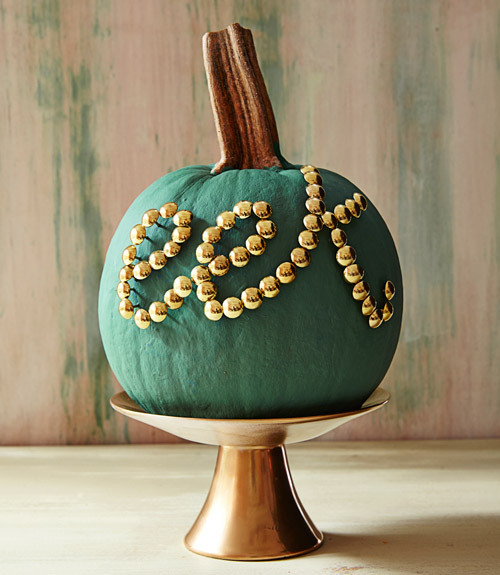 Spell out any word on your pumpkin by using golden thumb tacks. Spell out “Boo” or “eek,” or whatever creepy message you want to use. via brit.co. Beetlejuice is an epic Halloween character and famous for his black and white striped suit. Turn your pumpkin into the famous character by painting it with black and white stripes. via brit.co. There are many different images that you can paint on your pumpkin, and the spiderweb is just one of a few iconic images associated with Halloween. Paint the fruit black, and create a large spiderweb on the body. Don’t forget to glue a plastic spider in the middle of the web, too. via yesterdayontuesday. Another crayon-melting project. 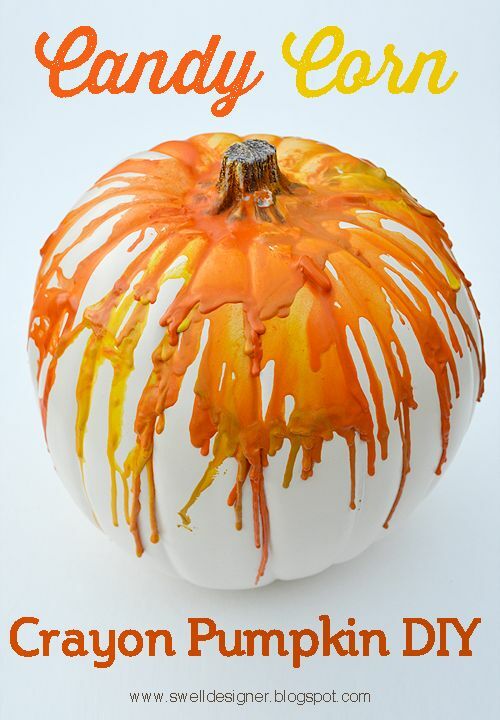 Create a candy corn dripping effect by melting yellow and orange crayons on top of the pumpkin. via theswelldesigner. You don’t have to go all-out with your no-carve pumpkin ideas. 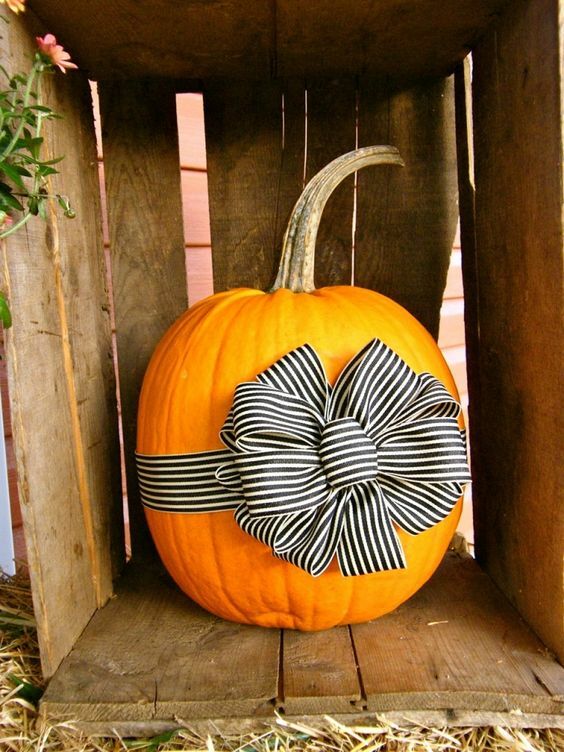 By simply wrapping it with a pretty bow, you can turn a drab old pumpkin into a pretty Halloween or Thanksgiving decoration. via mayarts. Everyone loves butterflies but blue butterflies are the rarest. Paint your pumpkins blue and glue some blue-painted plastic butterflies for a whimsical decoration little kids will surely adore. via sisterssuitcaseblog. Yes, you can turn your pumpkin into a majestic creature like the unicorn. 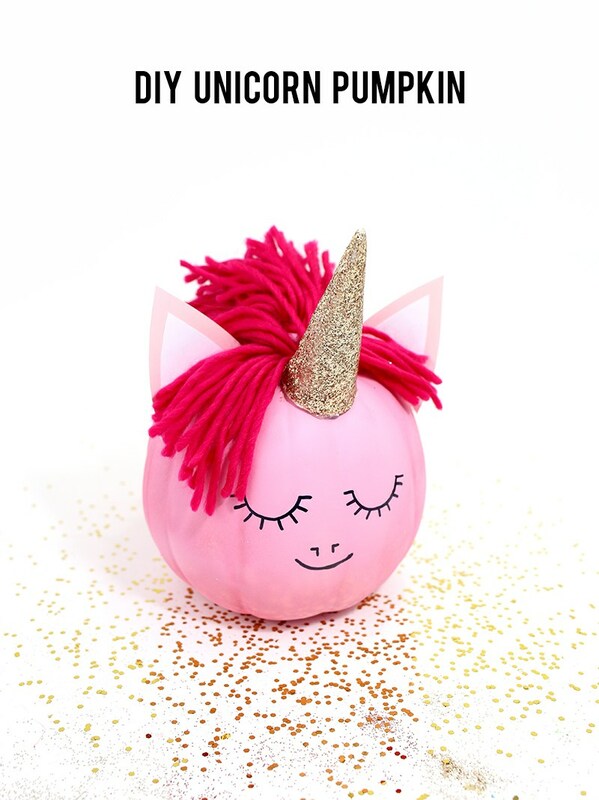 Simply paint the pumpkin pink, add some horse ears, and of course, a cone on its forehead to turn it into a beautiful unicorn decoration. via linesacross. 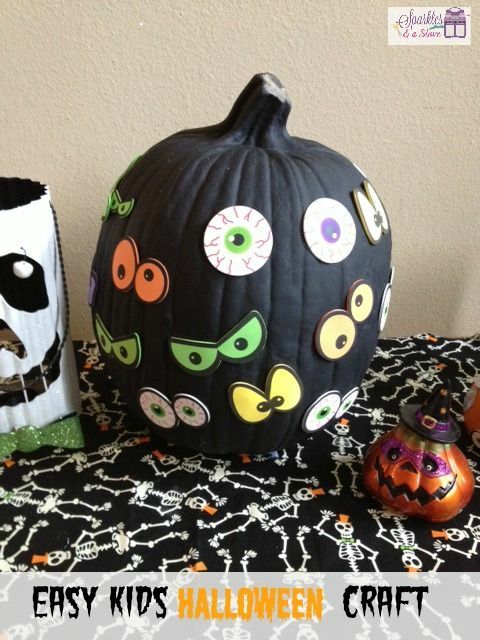 Cut out some eye ball images on paper and simply glue them all around your pumpkin for an easy-to-do and quick Halloween pumpkin decoration. via pinterest. If you want to get a few messages across without saying anything, why not write them on pastel-painted pumpkins? Write down “Happy Halloween” or “Boo” or “Witch Better Have my Candy” for some sense of humor as guests enter your home. Place them on your doorway for a few laughs. via studiodiy. 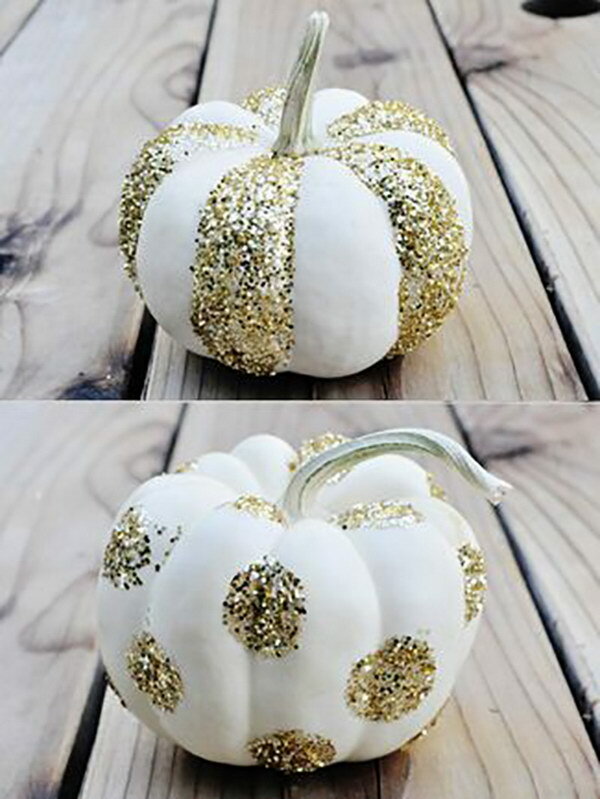 You can also play around with glitters and turn your pumpkins into precious little ornaments for your home. Paint them white and glue some gold glitter all around. Make stripes or polka dot with the glitters for a super girly effect. via fabulousdiydecor. 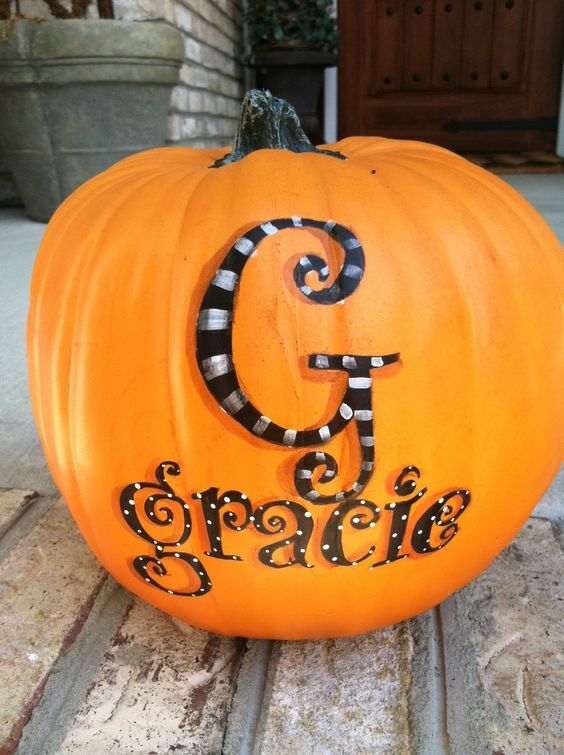 Decorate your pumpkins with initials of loved ones, or your own. You can use paint, or cut out paper, or any material to make your monogram. via preppyandpinknc. Channel your inner Morticia Adams by wrapping your white-painted pumpkins in black lace – eerily mysterious and beautiful at the same time. via bhg. Bring the beach to your home with these coastal-themed pumpkins. 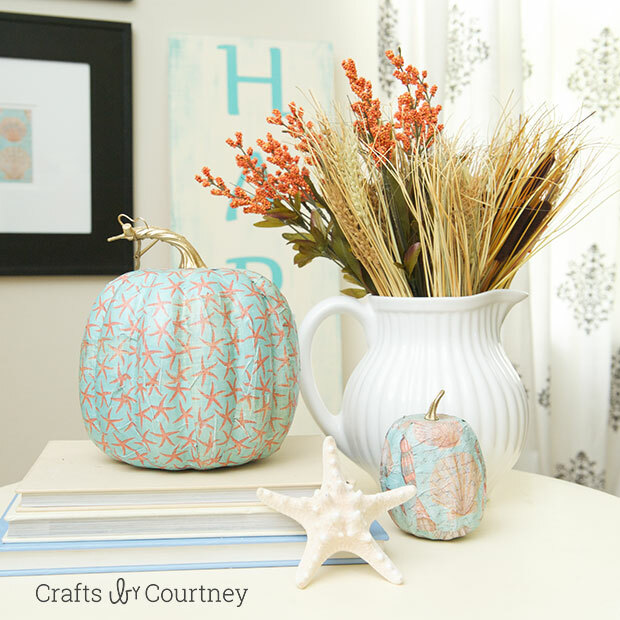 Paint seaweeds or waves on cool-colored pumpkins to add some nautical feel to your fall decorations. via sandandsisal. 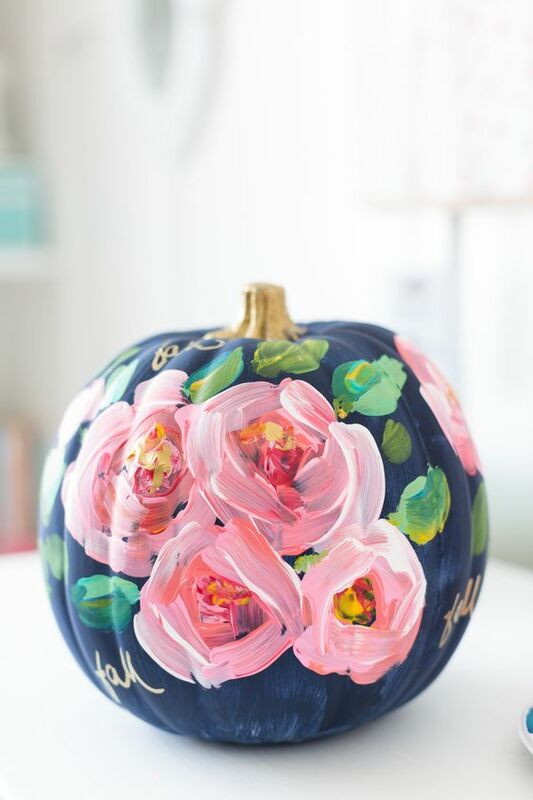 If you have the knack for painting, paint your pumpkins with elaborate flowers and images to create unique art pieces. via ilovetocreateblog. 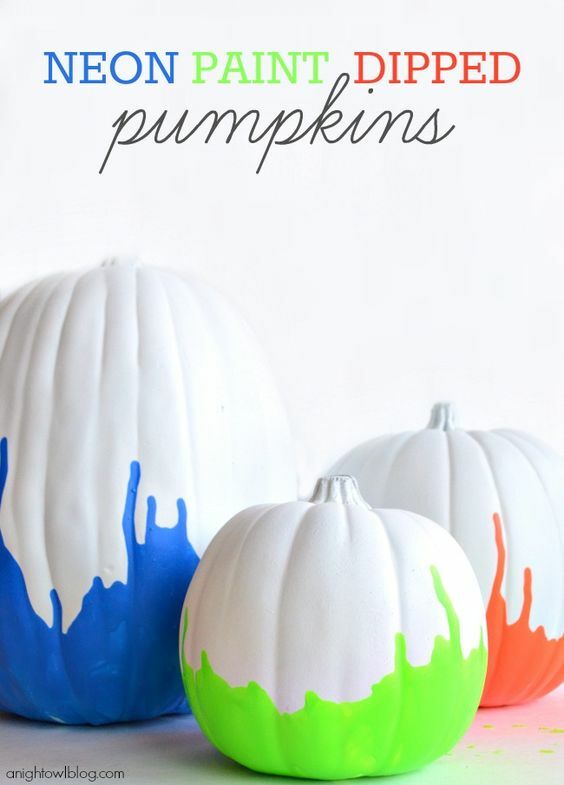 Collect a good number of tiny pumpkins and paint them with glow in the dark paint. Leave them at night in dark corners and places and watch the beautiful colors light up. ilovetocreateblog. 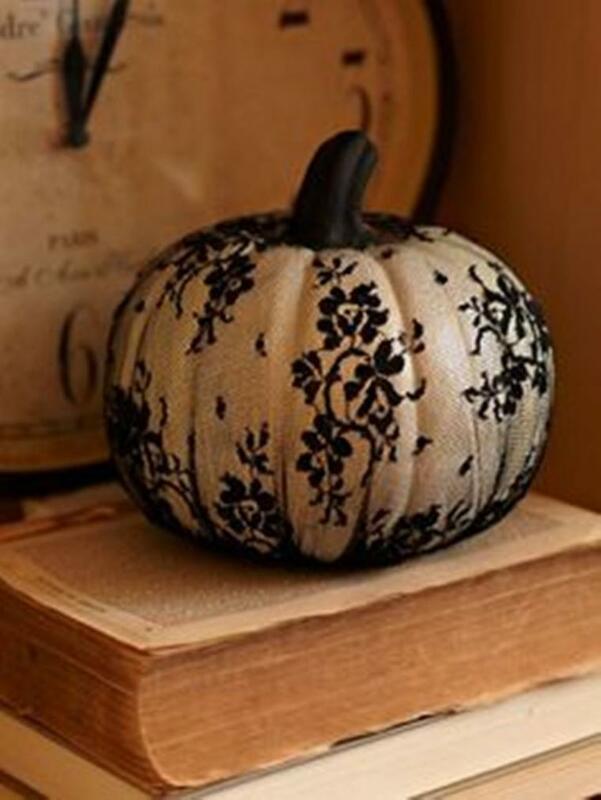 Make your pumpkin look like a beautiful paper weight by painting it with beautiful flowers. via craftberrybush. 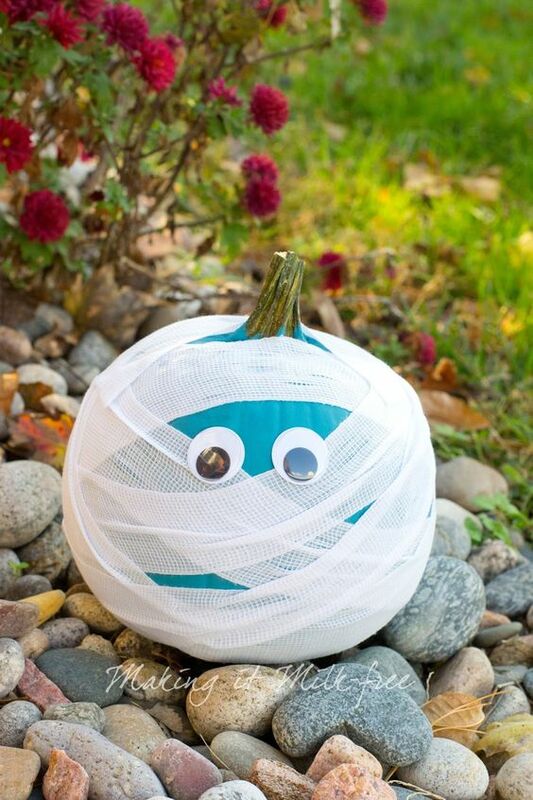 Glue a pair of googly eyes on your pumpkin and wrap it with white tape to make it look like an adorable mummy’s head. Make a few and scatter them all around your yard or home. via makingitmilkfree. 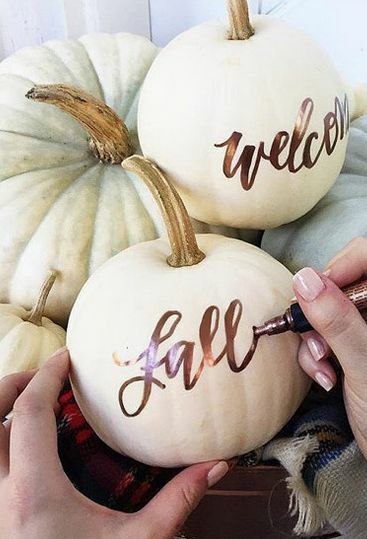 Spell out Halloween greetings by using painted pumpkins to form words. 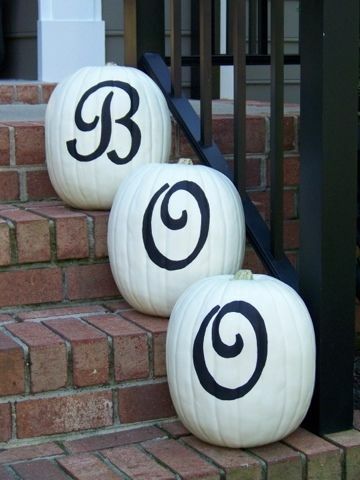 Make the words as short as possible, though, such as “Boo” or “Eek” so you won’t have to use too many pumpkins. 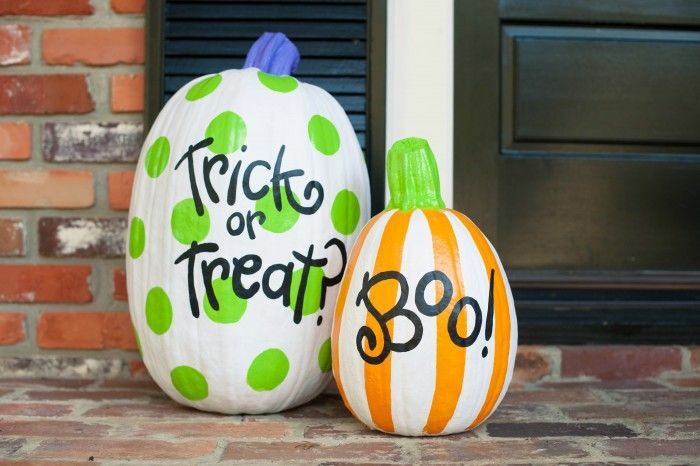 Color your pumpkins in circus colors and prints such as neon polka dots and orange stripes for a festive effect. 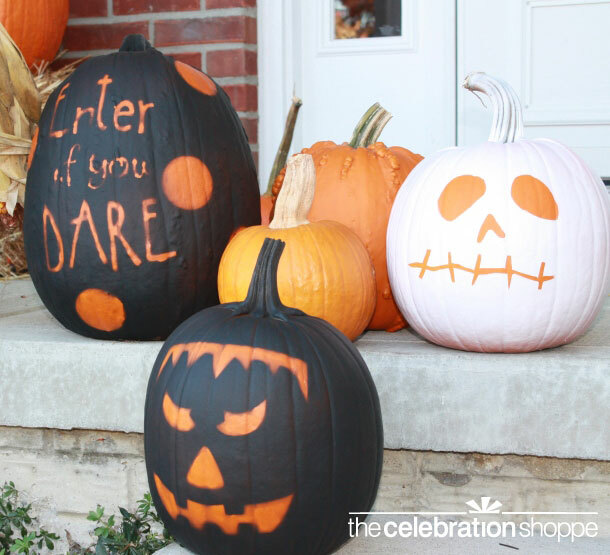 Write some Halloween messages in black and you’ve got a pair of Halloween decorations that are sure to bring in the fun to your home. via coton-colors. Metal studs have always been synonymous with the rock and roll lifestyle. 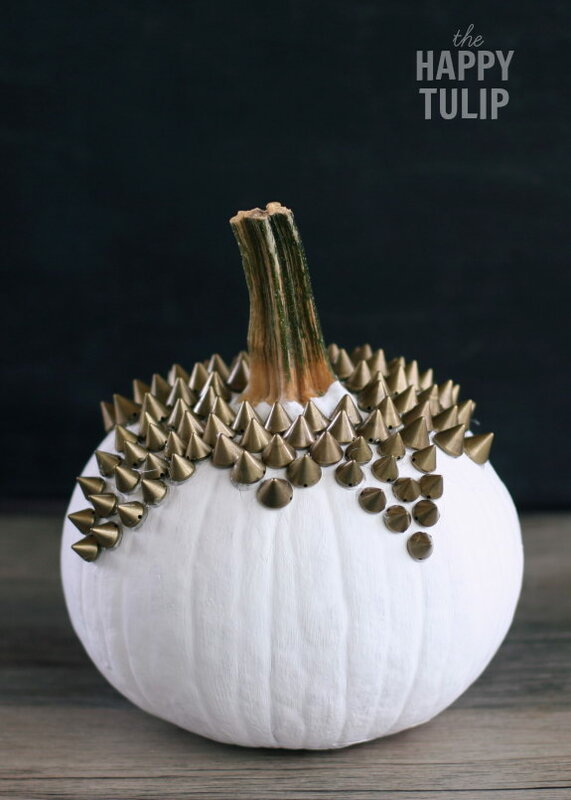 Paint your pumpkin white and decorate with metal studs for that badass pumpkin ornament. via thehappytulip. 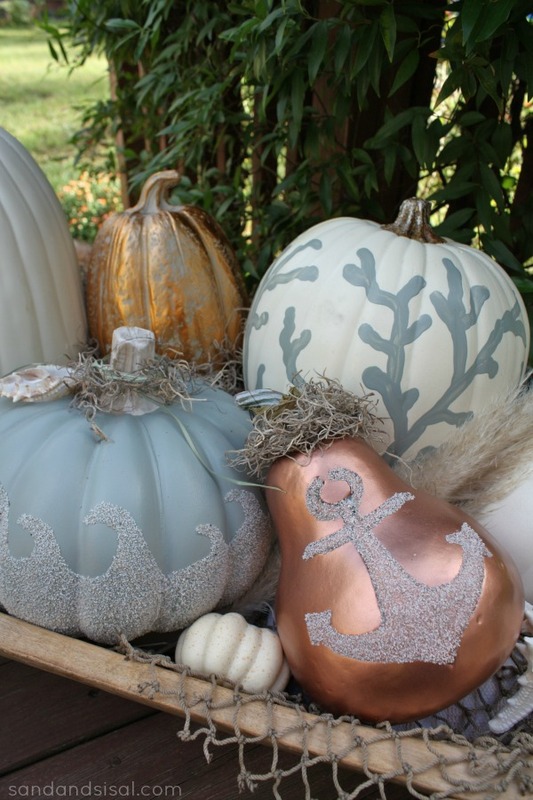 If you want the whole fall coastal decoration, why not paint your pumpkins with seaside images such as starfishes, or even an anchor? Decorate together with other seaside ornaments for a rich table decor. via craftsbycourtney.